Growing up, my favorite part about summer was going to camp. Over 20 years ago, I was a regular at a local horse camp where I would spend a few days being enamored by the tall creatures and learning how to ride. The summer of 2018 rolled around and the excitement was no different. Except this year, we would be attending FLY Racing Summer Camp. No horses here, just dirt bikes and the smell of fresh, new gear and everything you’d ever want for Christmas packed in a duffle bag with your name on it. We were greeted by a welcome party in Boise, ID, by the Western Power Sports and FLY Racing staff and their team racers including Blake Baggett, Zach Osborne and Weston Peick, along with mannequins showcasing the latest line of 2019 gear and apparel on a patio overlooking the city. 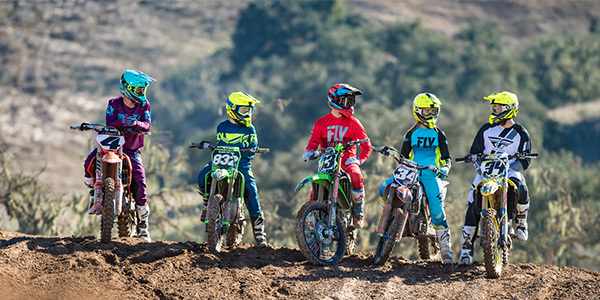 FLY Racing’s designers walked MPN through their new line, answering our questions, and showing and explaining the new technology, materials and fine tuned details that you wouldn’t be able to see in a catalog. Jason Thomas, FLY Racing’s sales manager, extended his thanks to the team who helped make the 2019 line possible. The new racewear collection included the Evolution DST (Durable Stretch Technology) that combines stretch mobility with durability that moves with the rider’s body; the Lite Hydrogen, the company’s lightest, most breathable racewear; the Kinetic Shield and Kinetic Noiz that deliver comfort and reliability with new, eye-catching colors; the Kinetic Mesh Era, designed to handle summer heat; and the Women’s Lite line made specifically to fit women for performance. The next day, we took a short drive out of the city to OMC Raceway to test out the new line of gear that was previewed the night before. I wore a Women’s Lite jersey with MPN’s logo screened onto the front. As a female rider, I have very seldom purchased women’s gear for the reason that it was either men’s gear in the color pink or too heavy and not anatomically fitted to a woman’s body in a comfortable fashion. When I put on the Women’s Lite jersey, I was relieved to finally have found a jersey that was fit to my body using lightweight and stretchable material and mesh ventilation panels. The jersey was long enough in the arms and didn’t ride up, thanks to the Shorty cuffs with elastic sleeves; nor was there extra, bulky material hanging at my sides. Also, it wasn’t pink, although that option is available in the new line, including hi-viz/blue, black and white. As far as fitting pants onto different body types, FLY Racing nailed the sizing with the BOA connection in the rear of the Lite Hydrogen pants. A circular dial quickly adjusts the pants to fit those who are in between sizes and don’t want their pants to fall off in the middle of a ride. The pants also have leather heat shield panels with DuPont Kevlar stitching and ergonomically, pre-shaped knees that accommodate knee pads or braces. I was able to break in some of FLY Racing’s FR5 boots. Microfiber gaiters on the boots prevented dirt and rocks from entering and the interior foam gave improved ankle support and stability. The boots featured a quick-locking buckle that secured tightly for riding and afterward could be opened completely to prevent dirt from clogging the buckle. FLY Racing makes a variety of gloves that can fit anyone’s preference. I wore the Pro Lite gloves and was confident in my grip when riding, especially for a glove that was so light. The gloves are designed with silicone finger grippers, a reinforced layer thumb and a single-layer perforated Clarino palm for improved airflow, and on such a hot day, I didn’t end up peeling them off my hands due to sweat. 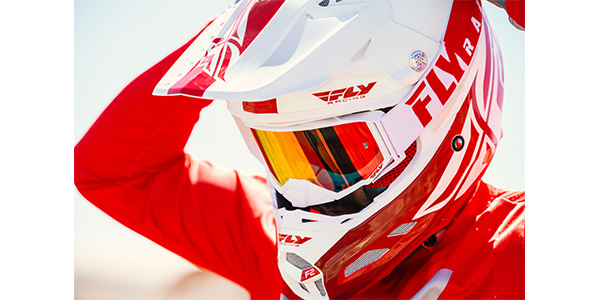 The F2 Carbon helmet was one of my favorite new products from FLY Racing in 2019. The helmet featured MIPS (Multi-Directional Impact Protection System) technology with True Functional Ventilation in its one piece, tri-composite carbon fiber shell. It was so lightweight; I was unbothered that I was wearing it in 100-degree weather under direct sunlight. After testing the gear, we headed out to Bogus Basin, a ski resort with summer activities for all of the campers including bungee trampolines, an alpine roller coaster and a rock wall. The campers concluded the day either mountain biking or trail riding down the mountain (over 20 miles downhill). Mountain bike riders wore the Freestone MTB helmet, Super D jersey and Maverik shorts, Media gloves, with knee and elbow guards and an XC100 Hydro Pack. MPN sends a special thanks out to Jered Coles, Doug Riipinen, Kyle Warner and the FLY Racing team who helped out one of our own after he got in over his head mountain biking down Bogus Basin. Our rider went over the handlebars three times and didn’t have a scratch on him, proving that FLY Racing’s gear is durable and offers excellent protection. The last day of summer camp is usually sad as you greet your parents and head back to your life back home. FLY Summer Camp ended on a positive note, with business cards exchanged, new gear in our bags, a camera full of great riding memories and the promise that we will be invited back next year.